The Weekend Gourmet: My Entry in Biscoff Spread's Lunch Envy Contest: Wolf's Afternoon Pick-Me-Up Sandwich...and a Biscoff Spread GIVEAWAY!! My Entry in Biscoff Spread's Lunch Envy Contest: Wolf's Afternoon Pick-Me-Up Sandwich...and a Biscoff Spread GIVEAWAY!! My nephew Wolf and I have been conspiring behind the scenes lately...via telephone and Facebook...working on a covert project. The objective? To create a tasty lunchtime (or after-school) treat featuring Biscoff Spread. The Lunch Envy contest asked food bloggers and their children to create an original recipe to put a new spin the usual school lunch...a recipe that makes all your friends envious of what YOU brought to eat!! The only requirements are that it has to be a collaboration, Biscoff Spread has to be the featured ingredient, and you have to create a video showcasing your creation. When I was invited to take part, I initially declined since I'm not a mother. The only "kid" I have is orange, furry, and lacks the opposable thumbs necessary to help me in the kitchen. Besides...it doesn't help that this is how Lucy spends most of her days. 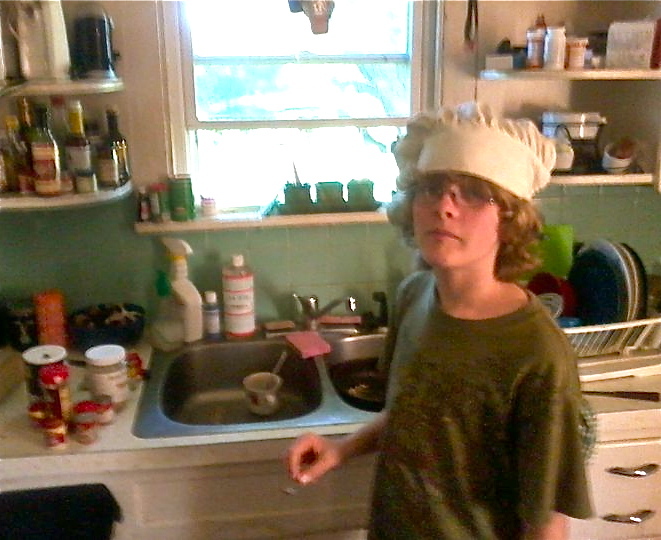 However, the people at Biscoff said that I could team up with my teenage nephew Wolf and enter the contest. Wolf is 13 years old and lives in Rock Creek, Ohio. Yep...that's a long way from Texas, which means I don't get to see him -- or his brother and sister -- very often. My sister, Tina, is a fantastic cook and fellow food lover...and this trait has rubbed off on Wolf. As you can see from this picture, he loves to cook. We have fun talking about recipes and different foods to try...he and Tina recently made the spaetzle from one of my Daring Cooks challenges. Thanks to modern technology, we stay close despite the distance...we like to talk on the phone, use Facebook, etc. to stay in touch and share recipes and foods. The distance was a small challenge we had to overcome when entering this contest. We brainstormed on the phone and came up with our lunchtime creation: Wolf's Afternoon Pick-Me-Up Sandwich...featuring yummy Biscoff Spread. If you've never heard of -- or tasted -- Biscoff Spread, here's the scoop. It has the consistency of peanut butter, but it contains no nuts. That makes it a great alternative for people with nut allergies! The flavor is a bit like brown sugar-caramel, with a hint of cinnamon and other spices in the background. It's so good! Biscoff sent me several jars of the spread to work with as Wolf and I created our contest entry. We knew that we wanted to make a sandwich, but we wanted it to be anything but the ordinary...the name of the contest is Lunch Envy, afterall! We decided to play up the cinnamon flavor of the spread by using cinnamon-raisin bread. We flavored the Biscoff Spread with a bit of honey, some vanilla bean paste, and just a bit of cinnamon and nutmeg. We layered the spread with sunflower seeds for crunch. Then we topped it with sliced bananas...because one my all-time-favorite sandwiches is peanut butter with banana. It works just as well with the Biscoff Spread! This sandwich tastes great...and it gives you the energy you need to make through a busy afternoon at school OR work!! Step 1: Add 1/2 cup Biscoff Spread, 2 tbs. honey, 1 tbs. vanilla bean paste (optional, but yummy! ), 1 tsp. cinnamon, and a pinch of nutmeg to a small bowl. Stir well to combine. Step 2: Spread half of the spread on one slice of cinnamon-raisin bread. Sprinkle evenly with roasted, salted sunflower seeds. Press them in slightly so they don't fall out when you eat the sandwich. Step 3: Cut a banana in half, then cut the half lenthwise...it should be the size of the bread. Layer the sliced banana on top of the sunflower seeds. Top with the second slice of cinnamon-raisin bread, and slice with a serrated knife. The combination of flavors and textures in the this sandwich is really nice...the sweet creamy spread, the salty and crunchy sunflower seeds, and the banana -- all combined with a fantastic cinnamon flavor in the background. The other part of the entry is a video...which is a bit of a challenge given the logistics of being in two different states. I've come up with what I think is a creative solution: a video slideshow that I'll be setting to music and posting on YouTube tomorrow. I promise to share the link once the video is live. Wolf and I hope that our sandwich recipe will be a winner...the grand prize in the contest is two iPads!! Wolf and I would use the iPads to Skype with each other and share more recipe ideas across the miles. Oh yes, the giveaway! 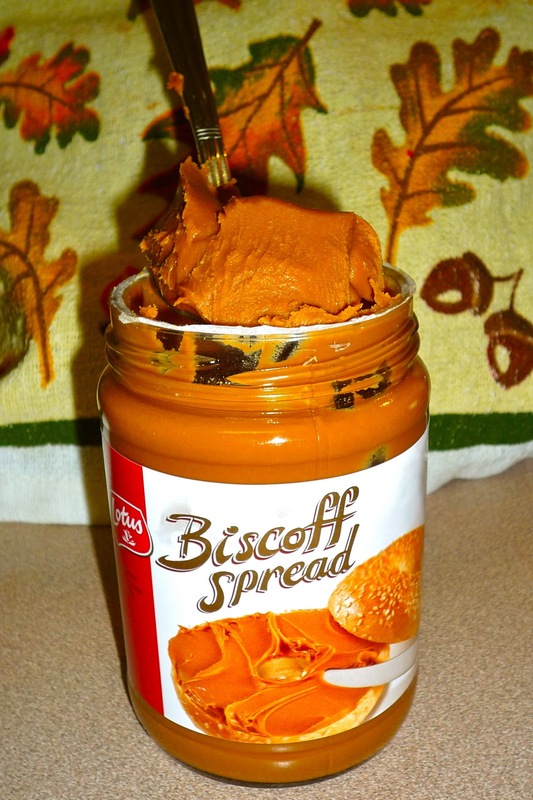 So...how would you like to try a jar of Biscoff Spread? I thought so. In honor of the Lunch Envy contest, I'm going to give a jar of Biscoff Spread to TWO of my readers! To enter, all you have to do is leave a comment below...along with your e-mail address. Tell me how you would use the Biscoff Spread in your kitchen. I'll pick two winners using a random number generator on Thursday. It's that simple. What a great sandwich, and how cool that you got to do this with your nephew. Great bonding time for both of you (even if it was long distance). I have never tried Biscoff! I would try it on my english muffin for breakfast, I would back cookies or blondies with it. I can think of so many things!